Excellent article on history of SNC and its owners. This "take on Musk" narrative the media comes up with? yawn. Done properly there is plenty of room for SNC, Blue, and SpaceX in the transport business. I agree...in fact if SNC can ever "fly" I predict that they will become the premier "down mass" provider. We can add US engine designer and manufacturer to SNC capabilities. The engine is called VR35K-A and uses liquid hydrogen and oxygen. Presumably, the 35K refers to 35 klbf or 156 kN (or may 35 kN if they are with the program!). No idea what engine cycle they are using. Its used "state-of-the-art technology and a VORTEX flow field to cool the inner walls allows the new engine to be simpler, smaller and lower cost." This press release from a few years ago https://www.sncorp.com/press-releases/snc-orbitec-vortex-rocket/ mentions a 65klbf hydrogen engine as an eventual goal. Is this an incremental upgrade towards that (original was 30klbf), or a downgrade of that plan? I am also interested in this engine because I believe that crewed DC was supposed to use a vortex engine for its abort motor but I don't know if that engine is related to it. It's definitely related to it, by virtue of also being a vortex engine. The abort motor was to be pressure fed, and different propellant, of course. What's unique about the Vortex engine? From the sounds of it, it's just film cooling of the thrust chamber; something that's been done plenty of time. 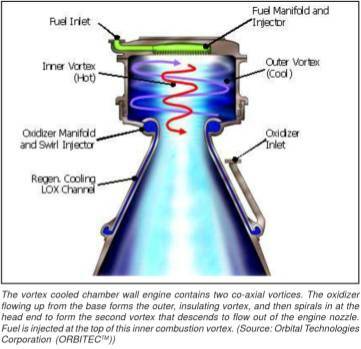 ORBITEC is focused on the development and demonstration of innovative, low-cost components for propulsion systems, including the “Vortex Combustion Cold-Wall (VCCW)” thrust chamber assemblies for boost and upper stage applications. The VCCW uses ORBITEC’s revolutionary, patented vortex combustion process to confine propellant mixing and burning to the central core region of a coaxial vortex flow field. This enables dramatic cost savings through robust design margins leading to extremely high durability, reliability, and reusability in engines that are inexpensive to manufacture and maintain. So the main advantage of this design is it keeps the hardware cooler?